W.K House Clearance company is a recommended service covering all areas in England Scotland & Wales. We are fully licensed & insured, WEEE waste compliant and approved contractors for the Environment Agency ready to undertake all aspects of House Clearance. If you have a house that needs clearing, we understand that it can seem like a daunting task. That’s where we come in. House clearance doesn’t have to be your next project, we can take care of the hard work for you. We will always work closely with you to ensure that everything happens exactly to your specifications. We clear everything requested such as, cookers, washing machines, carpets, unwanted junk, clutter, and furniture, we also provide a cleaning service if needed, this can help if you are selling or planning to rent the property out. Please ask about our cleaning services & costs. We can carry 1 ½ tonnes of household waste in one of our large luton vans, we have found from experience that this weight covers the clearance of most average three bedroom houses. If it looks likely that there will be excess weight then we will endeavour to bring this to the client’s attention at the start of the Property Clearance, or as soon as it is recognisable. If requested we can also clear vehicles to. We also clear, lofts, garages, office spaces and commercial buildings. 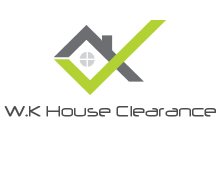 W.K House Clearance Service is a family run business and have performed full House Clearances throughout the UK for many years now. we understand that for many people House Clearance is not something they have dealt with before so if you have any questions please feel free to Contact Us and we will be more than happy to provide you with free impartial help or steer you in the right direction with any House Clearance query. We understand that we may work in the wake of bereavement, so we always work with respect and dignity in mind. We pride ourselves on our expert, friendly team of clearance specialists, so if you have any questions or concerns, don’t hesitate to ask. Our team will donate all your old, unwanted furniture and belongings to local charities in the area. What can’t be donated to charities will be recycled. We enjoy helping our customers. With our experience and expertise we can have your home fully cleared in just a few hours. All of our vans are unmarked for your discretion.